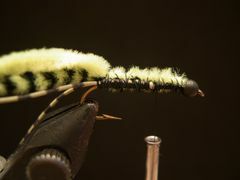 The CVC Nymph with its chartreuse and black color pattern and chartreuse centipede legs is an outstanding bluegill and bass fly. 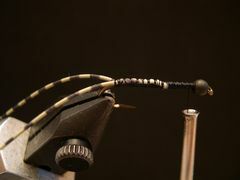 The CVC Nymph is an easy fly to tie. The only challenge new tiers might face is tying in the tail and the legs. To tie in the tail, fold a piece of centipede leg so that both ends are even. The thread should be hanging in the middle of the hook shank. Slip the folded leg loop under the shank at the thread. Pull up on the legging material, catch the end of the loop with the thread, and bind it to the shank. 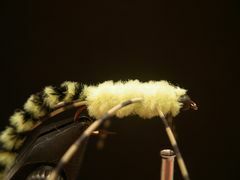 Then, pull the legs toward the rear of the hook and bind down the rubber legs to the end of the hook shank. The tail should now be splayed at the back of the hook. The thread should be at the two-third's point on the hook shank. Fold a piece of legging material around the hanging thread and move the material with the thread to the far side of the hook shank. Once the legs are in place take a couple of hard wraps of thread to fasten them tightly to the shank. Repeat the same process with a piece of legging material on the near side of the shank. This is how you tie in rubber legs "Madame X" style. 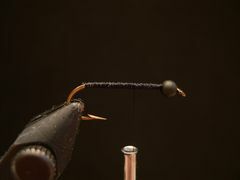 Fish the CVC Nymph on a weight-forward line with a seven and one-half to nine foot 3X tapered leader. I like to fish the nymph with short steady strips. Slip a cyclops bead over the hook point and move it up to the hook eye. Start the thread at the the bead and lay down a heavy base of thread from the bead back to the hook bend. Tie in the tail as per the instructions in the Tying Notes section. Then move the thread to the base of the bead. 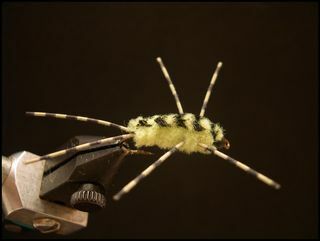 Tie in a three-inch piece of chartreuse veriagated chenille at the base of the bead and bind it down to the top of the shank back to the base of the tail. 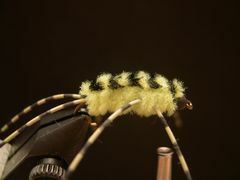 Bind down a six-inch piece of chartreuse chenille on top of the veriagated chenille from the bead back to the base of the tail. 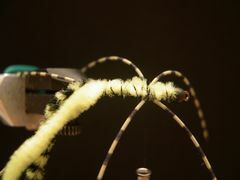 Move the thread to the two-third's point on the hook shank and add the legs as described in the Tying Notes section. Move the thread to the base of the eye. Pull the rubber legs forward as shown and take a couple loose wraps of thread. 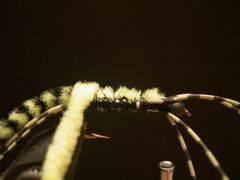 This step keeps the legs out of the way while you're wrapping the chartreuse chenille up the hook shank. 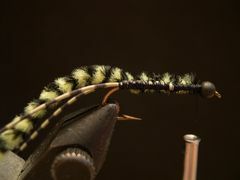 Wrap the chartreuse chenille up the shank to the legs. Release the legs. Make one wrap through the legs and one or two wraps toward the bead. Tie off the chenille and remove any excess material. 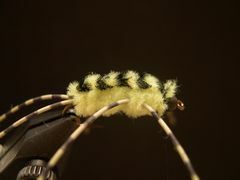 Now, pull the veriagated chartreuse chenille for the shellback forward; bind it down with a couple tight thread wraps. Clip any excess material. Tie off the thread with a super-glue knot. Wet about one half-inch of thread with the super-glue. Take two or three turns of the wet thread on top of each other and clip the thread. The knot will hold. Your CVC Nymph is ready to fish.